Combine sugar and water in a small saucepan. Bring to a boil, and cook 1 minute or until sugar dissolves. Remove from heat; stir in rum and lime juice. Cool completely. 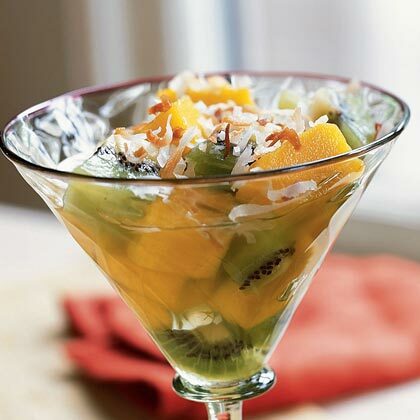 Combine mango and kiwifruit; add rum syrup, tossing gently. Sprinkle with coconut. You can substitute rum for mango nectar or fresh orange juice.